in innovative simulations of top regional IGOs! one of the top destinations in Europe and the Mediterranean! Being academically innovative and challenging, RhodesMRC is as an ideal bridging between the practice of Model United Nations and the continuous emergence of strong regional international organizations. Our commitment “towards effective peacebuilding and sustainable development on a regional level”, and the unique characteristics of our institution are highly appreciated by our participants! RhodesMRC is an amazing experience for all! Accessible to teenagers, young adults and professionals, it provides a solid academic experience before the unique cultural and historical backdrop of Rhodes, with its famous Medieval City, a UNESCO World Heritage Monument. What makes RhodesMRC a top choice for your annual academic endeavour? The People of RhodesMRC are the people in charge of organizing, supervising and executing this amazing academic experience. Since its launch in 2010, RhodesMRC has been received as an innovative tool and platform that promotes youth development. Every session of RhodesMRC is carefully and thoughtfully prepared by a wonderful set of people, totally committed to bring you the best of simulation experiences! Let's see some numbers for this year's edition! Stay tuned on all our latest news, development on preparation and more! 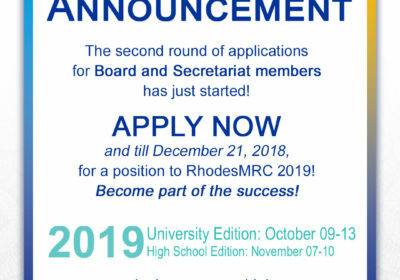 In 2019, the RhodesMRC edition will include two separate conferences: The University Edition (09-13 October 2019) and the High School Edition (7-10 November 2019).